So when I was making my Salt Dough Leaves, we also went ahead and made some cute Halloween characters. And then I glittered them and strung some baker’s twine through them to make a simple halloween salt dough garland. I’m having a halloween party this year and so I’ve literally been decorating for halloween for over a month. Insane? Maybe. Above it I hung a Spooky Halloween Banner that says “Beware” made from book pages. Simple to make–here’s the tutorial! I sent out the halloween party invitations via evite and my brother responded with “Maybe. That seems a bit early for Halloween.” My party is in two weeks…what do you think? Too early? In my mind Halloween has been going on for a month! 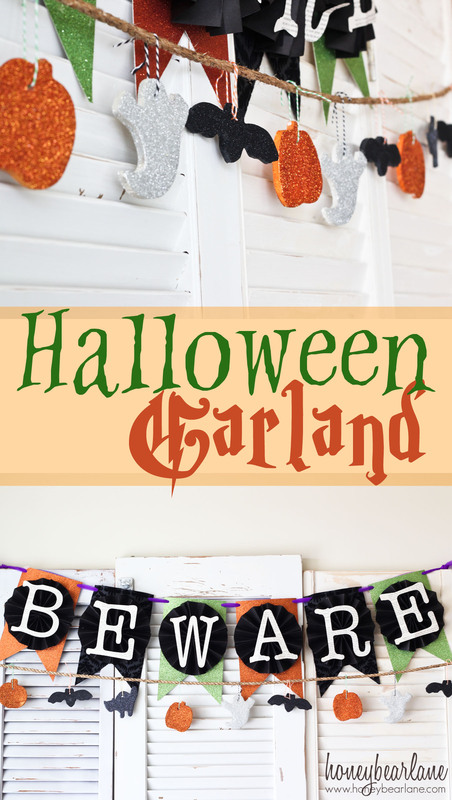 I love this cute little garland. 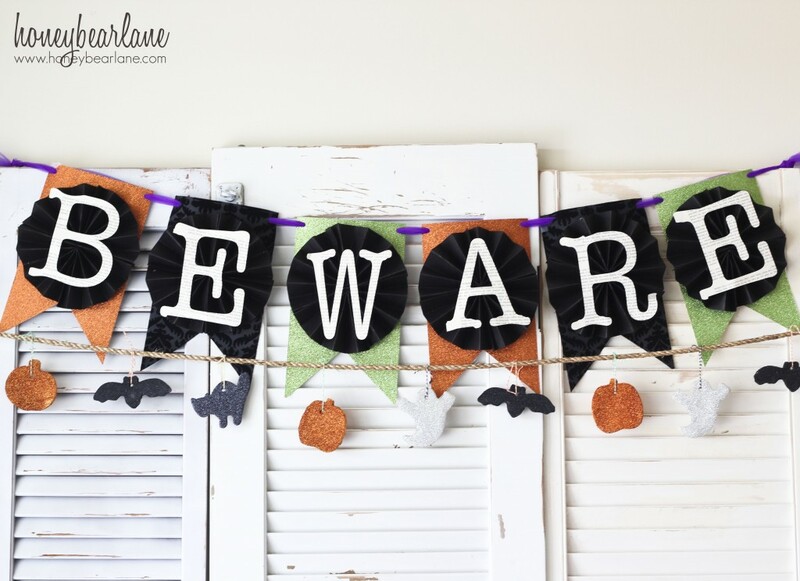 It’s such a fun way to bring Halloween into your house without being too creepy. It’s also a great craft to do with your kids! My 4-year-old and I had a blast cutting out the shapes with cookie cutters and then baking them. Then we painted them and glittered them, just like with the Salt Dough Autumn Leaves. 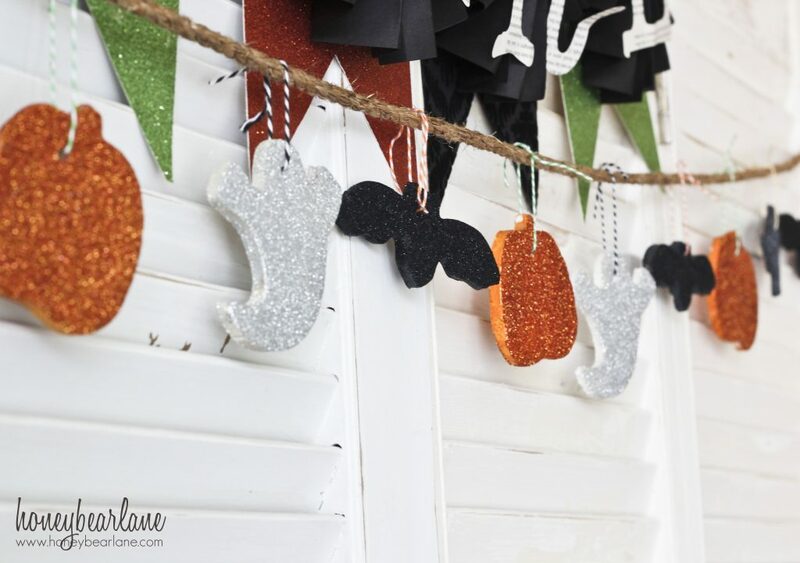 Love this; definitely gets me in the festive mood to decorate for Halloween. Thanks! I love the way it looks in my house. This is so cute!!!!! Looks easy which is always a plus. It is easy and fun but it does take some time. A good project to work on with the kids. Forgot???? Can you post the salt dough recipe? Thank you. Yes I did!! Thank you for reminding me. The link is on the Salt Dough Fall Leaves post. First, which brother responded with that? What do they know anyway…I think it’s better to have a Halloween party earlier in the month because then you get a better turn out. Too many people try to have it on the actual weekend and then I never know what to do. Second, I really like this idea, especially since it looks like something Hendrik could help me with (i.e. keep him busy). It was Brian. And that was my thinking–having it earlier so that people could attend. Also it was the one weekend the hubby wasn’t on call.